Gimadeev, Rustem Anasovich (candidate of philological sciences, 1956-). Systems. Requirements: 1GHz or higher PC; RAM 512 MB or higher; Windows XP SP3, Windows Vista; Windows Media Player; video adapter; sound. card. Topic: A.S. Pushkin: serving the Fatherland. Literature lesson "A.S. Pushkin: Service to the Fatherland" is dedicated to the personality and creativity of A.S. Pushkin and timed to the 215th anniversary of the poet. Particular attention in the lecture is given to Alexander Sergeevich's world view and his reflection in the works . I. Presidential Library. B. N. Yeltsin (St. Petersburg) .1. 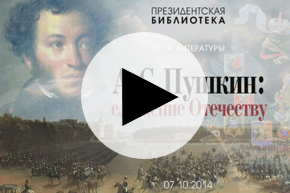 Pushkin, Alexander Sergeevich (1799 - 1837) - Anniversaries - 2014 - Multimedia editions. 2. Pushkin, Alexander Sergeevich (1799 - 1837) - Multimedia publications. 3. The people (the collection). 4. Russia in the faces (collection). 5. The fact and image of Russian history in the works of Russian writers (collection). 6. Video lectures.